I've been having loads of fun searching through my stash of dies for ones that seem suitable for making stencils with pieces of Window Sheet. Today I selected the Detailed Floral Thinlits. add some bling to the flower centres! Having smooshed (yes, I'm sure that's the technical term!) 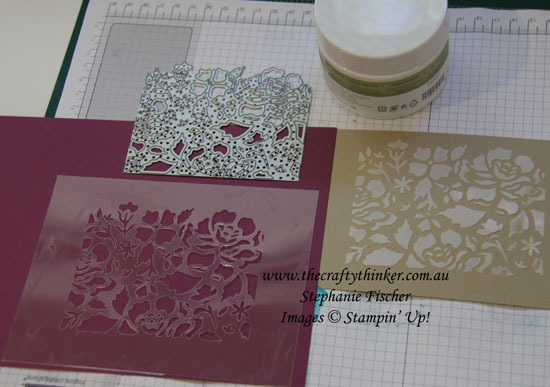 the embossing paste through the stencil onto Crumb Cake cardstock and let it dry, I put the (clean, dry) stencil back in position and used a sponge dauber to apply colour to the floral pattern. I layered the piece onto Very Vanilla and Fresh Fig panels and adhered it to the front of my Crumb Cake card base. The greeting is stamped onto Very Vanilla with Berry Burst ink. 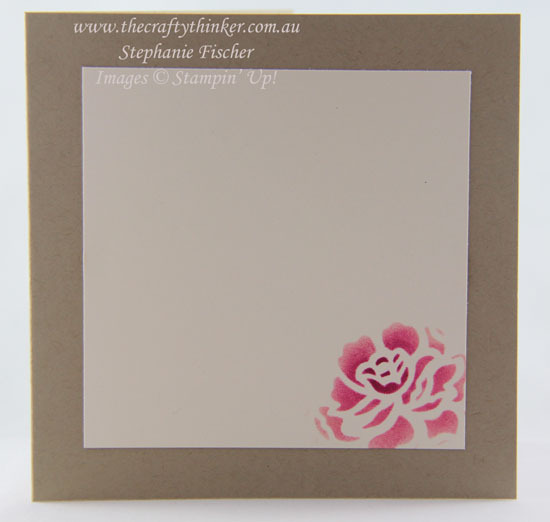 The label shape is stamped with Fresh Fig ink and the label cut with the matching die from the Rose Garden thinlits. I used the stencil and sponge daubers to decorate the inside of the card to match. Can you keep a secret? I'll be posting this card on Monday to someone who's initials are KB - the person who introduced me to the world of Stampin' Up! and who heads up the Crazy Crafters team - ssshhhhh!